I’m sorry but we did not have the anglers sign in so I do not have all first and last names. Those that I do have are Dale Christensen, Bill Keller, Bill Burgess, Frank Bielut, Ronnie, Joe and Ken – taking Ronnie’s place on day 2. Day 1 first bite was a nice Blue Marlin. We were able to get our stuff in and proceed to angle the fish when “The Three J’s” a blue hull bay built type boat an over the line and cut the marlin off. Great way to start the tournament. Caught 3 YFT and missed a Wahoo. 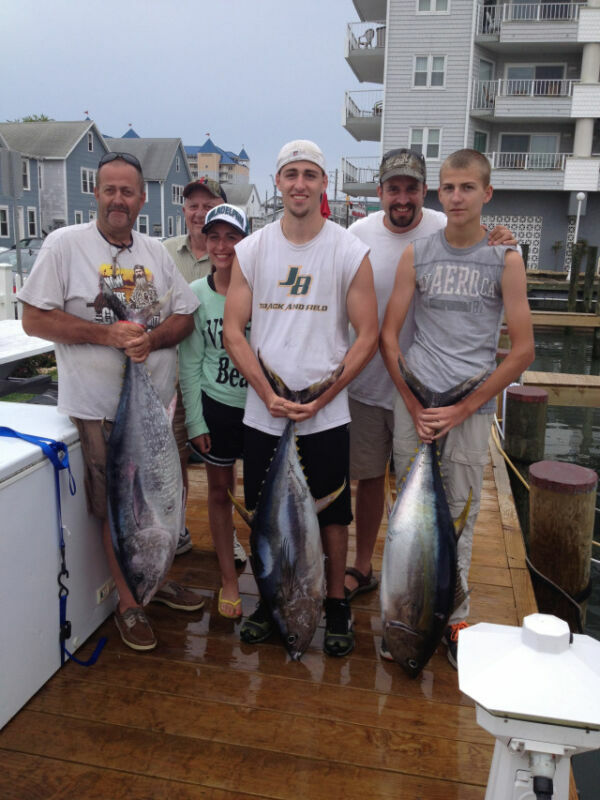 At 2:30 we hooked into a Big Eye tuna – what we wanted. After a 2 3/4 hour fight the hook pulled. Bill Burgess did one hell of a job fighting such a beast and it was his first time ever. Thanks for the super effort Bill. Day 2 was slower but better in a way. 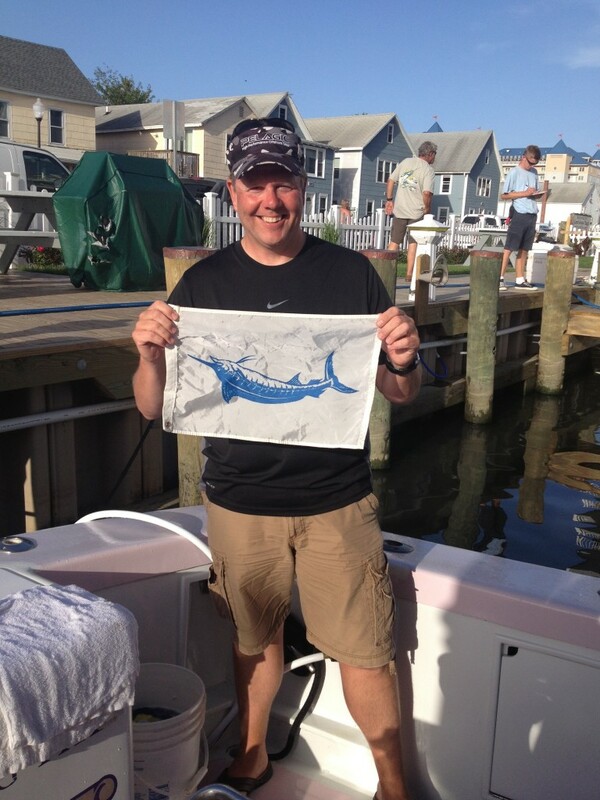 Bill Keller caught a Blue Marlin. We also missed a dolphin by the boat and caught 1 YFT. Big Eye bite slow today. Thanks to all !!! Enjoyed fishing with you all. Dale Carbaugh, Gerald Carbaugh, Danielle Friese, Trevor Carbaugh, Devin & Roger Carbaugh fished with us today, 7/11. They caught 7 BFT keeping their over & under – releasing 5. Also caught 2 YFT and missing 2 Wahoo bites. Great day and a pleasure having them fishing with us. Hot Dog still doing it !! On 7/10 we took Matt Schmitt of Wankeshe, WI and his father in law Harry Carey from Alexandria, VA. We had 3 BFT bites catching our over & under. Also had 2 dolphin bites catching 1 and went 0 for3 on the Wahoo bites.